The Ving Tsun Kung Fu system is an authentic and traditional martial art that is known for its efficiency and economy of motion. A Buddhist nun named Ng Mui developed the system about 400 years ago in southern China. Using her expertise in Shaolin Kung Fu, she combined the best techniques available and refined them into an efficient and new Kung Fu system. The goal of her system was to utilize the most economic physical movements to achieve maximum effectiveness against the power of other martial arts systems. Yim Ving Tsun was Ng Mui’s first student. Ng Mui taught the system to Yim Ving Tsun so that she could defend herself against a warlord who wanted to force her to marry him. Yim Ving Tsun successfully defended herself and began to pass the system along. 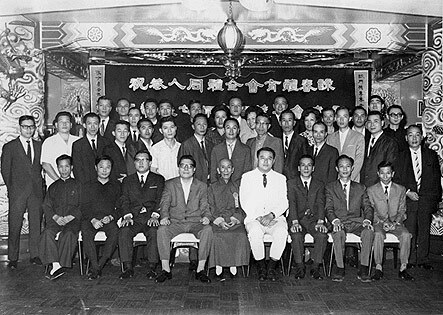 Grandmaster Yip Man is seated, center, with members of his kung fu family including Moy Yat standing directly behind the man who is seated second from the right. In recent times, the greatest master of the Ving Tsun system was the late Yip Man, who taught in Hong Kong in 1950s and 1960s. Among his students were the actor Bruce Lee and the man whose name the Omaha School bears, the late Grandmaster Moy Yat. Students training at the Omaha School can trace their Kung Fu roots in a direct line of succession to Grandmasters Yip Man and Moy Yat through their Sifu (teacher), Master Moy Yat Tung, and Grandmaster Moy Tung.